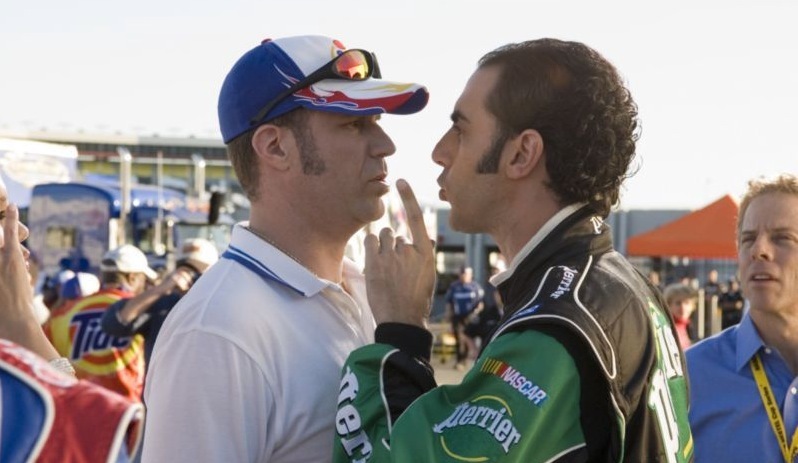 TALLADEGA NIGHTS has one of the greatest movie-stealing comic performances in recent movie history — Sacha Baron Cohen’s turn as Girard, a French Formula One driver coming to NASCAR to show oo eez bohss — the movie’s worth seeing to hear Cohen say “Formula One.” It’s worthy of comparison to Peter Sellers’ Inspector Clouseau. And no, it’s not “Victor just likes seeing the frogs made fools of” — I am an ALI G SHOW fanboy without any particular opinion of Austrians, Kazakhs or the West Side of Staines. Cohen, a brilliant parodic actor, plays Girard as a slightly, but only slightly, more masculine version of Viennese Fashionista Bruno. He’s somewhere between a collection of tics and a fully-formed character — we see him winning a race while reading L’ETRANGER (not THE STRANGER or THE OUTSIDER, btw) to a French-language cover of “Paint It, Black.” Which isn’t strictly speaking plausible, but so outlandish that it’s funny anyway. Cohen’s first scene — where he invades a bar to announce his intentions — so jump-starts the movie (and made me impatient during the subsequent scenes he’s not involved in) that it should be a front-runner for scene of the year in a certain movie-nerd poll. That is a shameless plug, BTW. I agree with Mikeski (scroll down to the 5s) that Cohen’s performance is so brilliant because it’s in such a different register from the rest of TALLADEGA NIGHTS. Cohen’s characters are turned-up-to-13 outsized caricatures, but Cohen plays them perfectly straight-in-their own minds. Michael goes on to say that it “subverts” the film; I’d say, with a slightly different agenda, that Cohen’s performance throws you out of the movie, but that’s not a bad thing for a parody, particularly one that sometimes forgets that it’s that. “The Ballad of Ricky Bobby” title, the initial obviously-fake quote from Eleanor Roosevelt and the pre-existence of DAYS OF THUNDER promise something as outlandish as AIRPLANE! or THE NAKED GUN. But TALLADEGA NIGHTS is a bit too laid-back in pacing, acting, and image style. Other than the NASCAR-style of product-placement on the cars, there’s no Boschian qualities of a frame from the Zucker/Abrahams team or THE SIMPSONS. Not frenetic enough for a movie that has jokes about “The Official Tampon of NASCAR”™ Again, the product placement aside, there’s little parody of NASCAR or the surrounding culture (the movie never takes us to the infield, say). There’s some other turns to like too, mostly in the category of actors doing their usual schtick turned up one notch too far or having some Southern-fried gravy poured over it — Gary Cole’s smarminess, John C. Reilly’s ingratiating best buddy. I see I’ve written most everything I wanted to say about this movie without mentioning Will Ferrell. I guess that’s because I think he works best as counterpoint, as straight man. He does it well, but actually being funny in and by himself (like running around the track in his tighty-whiteys and a crash helmet) — I don’t think Ferrell is that.